My new desk has some extension cables running underneath to provide data and also power conveniently on one end. I decided to use a 19″ 1U “KeyStone” patch panel because I like the variety and modular nature of these adapters. Well, things like HDMI (or even this DisplayPort voodoo!) 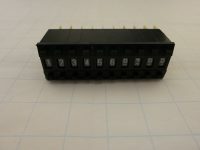 are hard to find in China, and 4mm banana plug keystones and audio jacks are basically the same price over here. 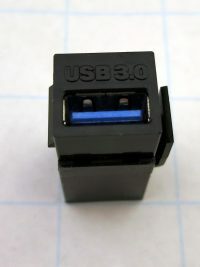 But USB seems very common – so why not buy an USB 3.0 keystone from the Wan Hung Lo factory? 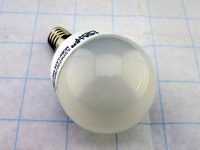 Bit unusual item today – a plain E14 LED bulb that is sold in Germany, made by a German company, but I suspect it is made in China. Müller Licht has some stuff actually manufactured in Germany as well, but I don’t think this one was. But as it is not clearly indicated on the bulb and/or on the retail package (as far as I can see from product photos), I cannot say for sure. Folks, this is a big one. I will split into two articles to make the item review available now and show the finished project later (once I got a box around it). Maybe even three articles to post DMM comparison data. Today, I will show the unit and the first measuring results.